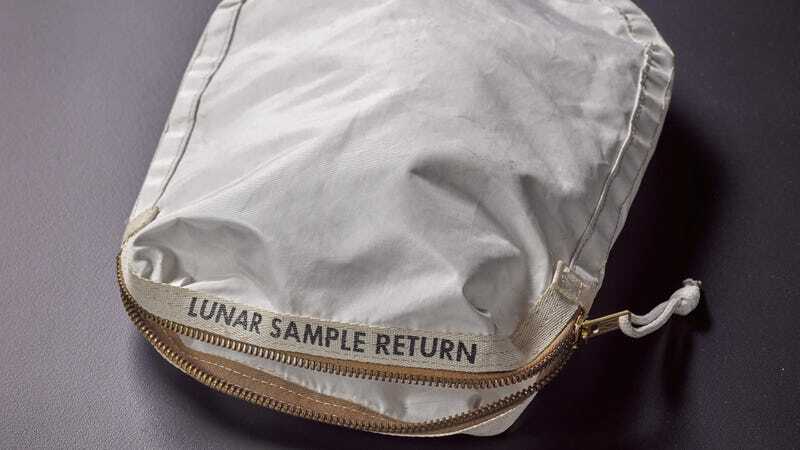 In 2017, Nancy Lee Carlson of Illinois auctioned off a genuine Apollo 11 lunar sample bag for $1.8 million dollars. That’s a good score given she purchased the bag for $995, but she was expecting as much as $4 million. The reason for the low value, she says, is that NASA damaged the bag—and she’s now suing the space agency to that effect. With the space agency refusing to return the bag, Carlson filed two lawsuits against NASA, one in Texas and one in Kansas. In February 2016, a Kansas judge ruled that the U.S. government mistakenly sold the bag at auction, and Carlson, a “good faith purchaser,” was subsequently “entitled possession of the bag.” On July 20, 2017, the bag was sold at a Sotheby’s auction, earning Carlson a cool $1,812,500—but Sotheby’s expected the bag to sell for between $2 to $4 million. That said, the judge in this case will have their hands full. The question of who owns the lunar material “enmeshed” in the bag will be particularly challenging, and it’s somewhat reminiscent of a current case in which a woman is claiming ownership of a vial of moon dust given to her by Neil Armstrong. NASA understandably doesn’t like to part ways with its lunar materials, but as precedent has already shown, it’s not always in control of its own stuff.